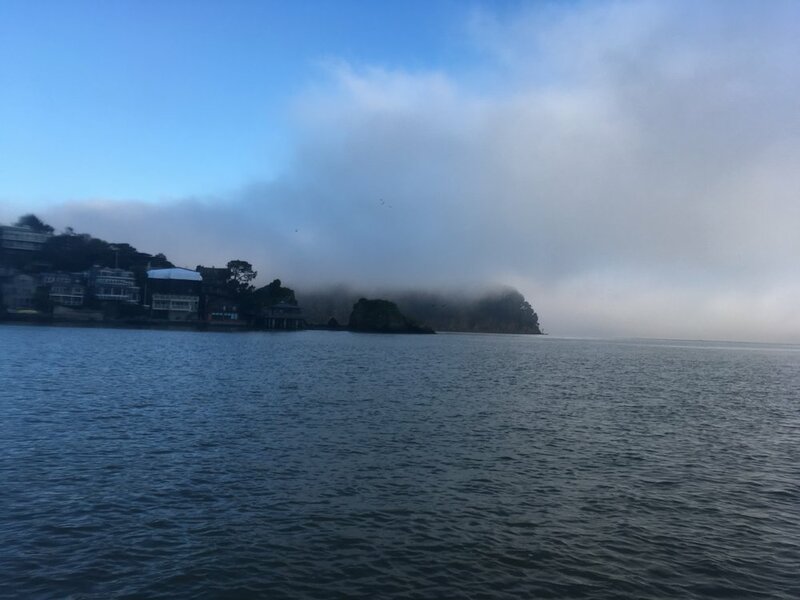 From Angel Island to San Rafael, you'll paddle by some of the best cliff houses in Tiburon, beautiful north bay, San Quentin (the maximum security prison), and San Rafael Bridge. East Bay is visible on a clear day with Richmond in the background. The current becomes less strong after Racoon Strait but it can still be strong with winter runoff. On January 14, 2017, after a beautiful cold evening camping at Angel Island and I got up early to get warmed up. 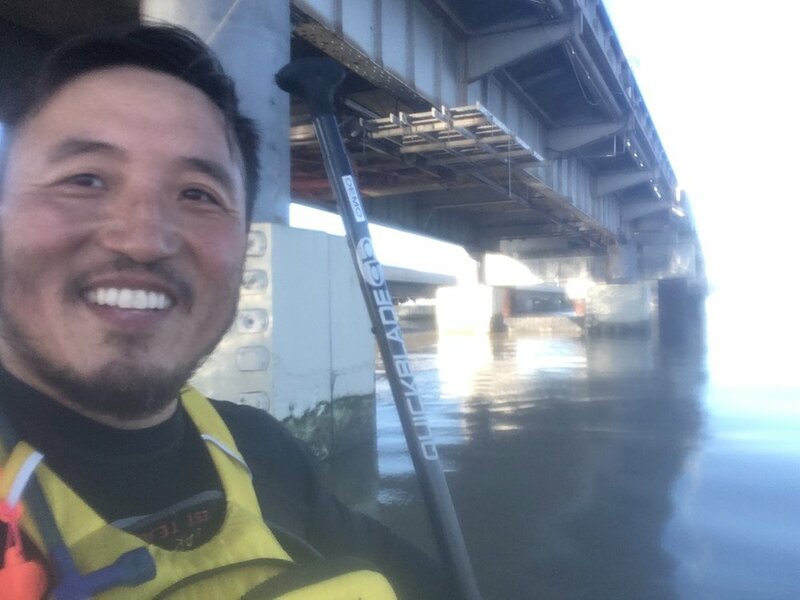 It was a long flat paddle to San Rafael against the current of the Sacramento River even with a slight flood. I tried paddling in the middle of the channel thinking that the current might be a little weaker there because of the turn in the bay but I was totally wrong, my speed went from 18 minute miles to 23. So back to the side and got better. 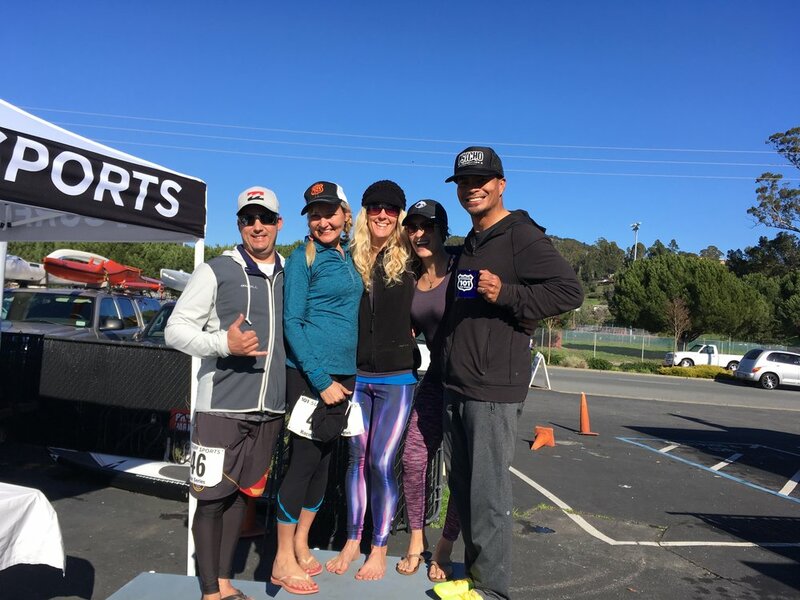 After the bridge, I joined some of the racers from 101 Surf Sports and celebrated the end of the run with other paddlers. Put-in: The kayak camp on Angel Island is on the northwest side of the island between Ayala Cove and Point Stewart. There used to be a cable crossing between Angel Island and Tiburon. The kayak camp trail is just behind the cable crossing pilings. It can be difficult to spot but if you see the black rock beach, you've gone too far. The trail is steep and you'll need to bring up your boards to about 100 feet up the trail where there's a clearing. Definitely do not leave your board on the beach because at high tide, there's no beach. Also with ferries and other boat wakes, the waves can reach pretty high up the beach above the high water line. The camp is awesome with lots of flat space, bear box, picnic tables and a bbq rack (no wood fires, coals only). Take-out: 101 Surf Sports is a great shop with a great community of paddlers and great gear for rental and retail. It's a mile into the San Rafael Creek.